Si-Huis Crane Lamps, photographed solely by the light of other Si-Huis Crane Lamps. Made of carbon fiber, fiberglass, polyester membrane, and rubber. Designed for the Philips Hue bulb, with unlimited color combinations, controllable by iPhone, iPod or iPad. 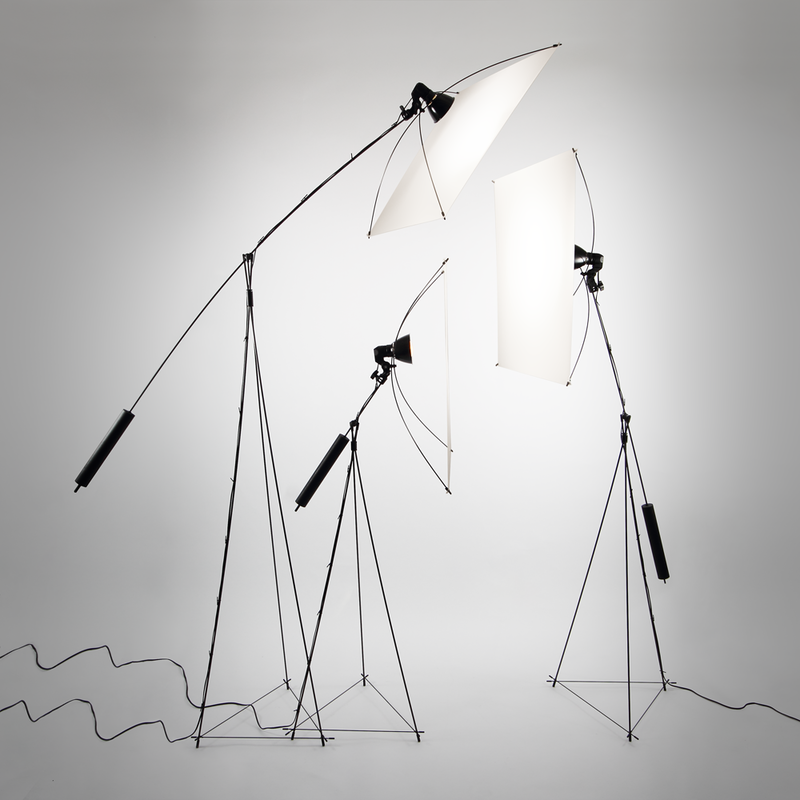 Lamp design and build by Michael Simon Toon, co-produced with Burton Landhuis and Vera Van Pelt. The same lamp can be used as an illuminated full color exhibition display up to 36" x 36". Apparently, Buckminster Fuller once asked Norman Foster, “How much does your building weigh, Mr. Foster?” which Foster could not answer. In 2011, we started making lamps with diffuser lampshades based on a ‘tensegrity’ engineering philosophy, a Buckminster Fuller method. However, if Buckminster Fuller's question were to be asked of the lamps we had made, our own answer would have been, “Quite heavy.” This question would determine the direction of our new lamps. Not only do they weigh and cost less than their predecessors but they perform equally well, or better. The diffusers are still ‘tensegrity’ structures, but they are very light, and with fewer parts, they are even stronger and more impact resistant. Put our lamp next to any existing floor lamp and give it the ‘Pepsi challenge’ for stability: Hit it. Kick it. Push it. Although eventually you’ll knock it over, the extreme flexibility in the rods allows it to bend like a reed in the wind. The counterweight should be just above the ground (on the lamps with long booms), which is where they are safest and most secure. As well as counter balancing the lamphead, the counterweight acts as an ‘inertia-air-anchor’ if the lamp receives a physical blow. The lamps will dance in response to impact (mainly the ‘twist’ or sometimes the ‘grandpa shuffle’); they may even jump, and then they will eventually return to their original position and stay there. If the stand was any more rigid, it could be pushed over gently with one finger. Instead, it acts more as if it’s made of jelly, or as if it’s being tickled. For lamps that are to be installed in gusty or hazardous conditions, matching sandbags can be easily placed over the stabilizers (rods at the base of the stand). The electric power cable fits snugly onto the boom and stand, with our very own special cable clips. We’ve used a combination of carbon fiber and fiberglass to achieve the perfect combination of strength and flexibility. We experimented with high-tech plastics, metals and even wood. No other materials performed as well under load, using the same dimensions. Carbon fiber and fiberglass return perfectly to their original shape after flexing, whereas most materials do not. The stand and boom bear their load while not being much thicker than the lamp's cable. Provisional patents have been filed for the diffuser, tripod and boom system. The lamps will be available through online resellers in 2014.